McBride was born in Lexington, Kentucky to parents John Leslie McBride and Suzanne Lillian (née Sagley) (1937–2018). Her father owned his own business, and her mother studied at the historic Pasadena Playhouse. She had three siblings: John Michael (1957–1990), Neil Allen (1960–2008), and Melanie Suzanne (1962–2012). McBride began her acting career in 1991, appearing in several television commercials for clients such as Rooms To Go; she was also a spokeswoman for Ford. She made her series television debut in a 1993 episode of ABC legal drama series Matlock, and later guest-starred in several other television drama series, including In the Heat of the Night; American Gothic; Profiler; Walker, Texas Ranger; and Dawson's Creek. In the last, she played Nina – a film buff who charms Dawson after his breakup with Jen – in the Season 1 episode "Road Trip" (1998) - and in 2003 returned to the series finale playing a different character. In the 1990s, McBride had supporting roles in several made-for-television movies, such as Her Deadly Rival (1995) opposite Annie Potts and Harry Hamlin, Close to Danger (1997) with Rob Estes, Any Place But Home (1997), and Pirates of Silicon Valley (1999). In 1996, she appeared on the CBS miniseries A Season in Purgatory, based on Dominick Dunne's eponymous 1993 novel. From 2000 to 2010, she worked as a film and commercial casting director in Atlanta, Georgia and starred in several short films. In 2007, director Frank Darabont cast McBride as the "woman with the kids at home" in the ensemble-cast science-fiction horror film The Mist, alongside Thomas Jane, Laurie Holden, and Marcia Gay Harden. McBride was in contention for a bigger role in the film but did not want to take a significant amount of time away from her job as a casting director. The following year, she appeared in the Lifetime television movie Living Proof. 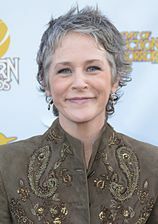 McBride's earlier relationship with Darabont led him to cast her as Carol Peletier in the AMC television drama series The Walking Dead – her biggest role to date. Peletier is a mid-forties widow and caring mother to preteen Sophia, fighting to survive in a violent post-apocalyptic world populated with flesh-eating zombies and the few surviving humans, some of whom are diabolical and even more dangerous than the zombies themselves. McBride did not audition for the role, which she thought was temporary. She was a recurring cast member in Season 1 and was promoted to series regular for Season 2. McBride's name appeared in the opening credits sequence beginning with the first episode of Season 4. Carol was supposed to have been killed off in the episode "Killer Within", but the producers eventually had a change of plans. As the series progresses, McBride's character develops from being weak and dependent, into a strong, cunning, and loyal warrior. The direction of her character is contrasted between the two media. In the comic series, Carol is much younger and exhibits a neurotic, self-centered, and naive demeanor. Throughout her time in the comics, she grows increasingly unstable to the point of being self-destructive. The television show differs in these regards, as she is shown to be a stern, pragmatic, and compassionate individual who has been gradually building inner strength. Producers of the series, Scott M. Gimple and Robert Kirkman, said in 2014 that "Carol is her own unique character; it would be a disservice to Melissa McBride to say she's evolved into the Carol from the comics. The Carol in the TV show is a wholly original creation that we'll continue to explore on the show to great effect. Everyone in the writers' room loves that character, and we're thrilled with what Melissa has brought to the table. She has definitely become a character that is one to watch, and there's some really exciting stuff ahead for her." McBride has received critical acclaim for her performance as Carol and won positive reviews from critics during Seasons 3, 4, and 5. Many critics praised McBride's performance in the Season 4 episode centered on her character, "The Grove". Others singled out Carol's actions in the Season 5 premiere, "No Sanctuary", which earned critical praise and positive fan reception. Despite the praise of some critics and a fan campaign, McBride did not receive a nomination for the 2014 Primetime Emmy Award for Outstanding Supporting Actress in a Drama Series. However, she won the 40th Annual Saturn Award for Best Supporting Actress on Television, and was nominated for the 2014 Critics' Choice Television Award for Best Supporting Actress in a Drama Series for her performance in Season 4. In March 2015, McBride was nominated for a Fangoria Chainsaw Award for Best Leading Actress in a Television series, for her role as Carol. She once again won the Saturn Award for Best Supporting Actress on Television at the 41st Saturn Awards, for the second year in a row. In the mid-1980s, McBride moved to Atlanta, where she still lives. 1993 Matlock Darlene Kellogg Episode: "Matlock's Bad, Bad, Bad Dream"
1995 American Gothic Holly Gallagher Episode: "Dead to the World"
1996 Profiler Walker Young Episode: "Insight"
1998 Dawson's Creek Nina Episode: "Road Trip"
2003 Dawson's Creek Melanie Episode: "All Good Things..."
2013 Conan Episode: "It's not the Hotlanta, It's the Humidylanta"
2017 Robot Chicken Carol Peletier (voice) Episode: "The Robot Chicken Walking Dead Special: Look Who’s Walking"
2018 Fear the Walking Dead Carol Peletier Episode: "What's Your Story?" 2019 Ride with Norman Reedus Herself Episode: "Scotland With Melissa McBride"
^ "Melissa McBride". Buddy TV. Retrieved March 23, 2015. ^ "Carol Peletier/ Melissa McBride". amc.com. AMC. Retrieved June 2, 2015. ^ "Birth Record of Melissa Suzanne McBride". MooseRoots. Retrieved October 28, 2016. ^ "Suzanne Lillian McBride Obituary". Dignity Memorial Obituaries. Retrieved August 7, 2018. ^ a b Villarreal, Yvonne (November 4, 2013). ""The Walking Dead" -- Carol on her own". Los Angeles Times. Retrieved April 2, 2015. ^ "Neil McBride Obituary". Legacy.com. Retrieved September 15, 2016. ^ "In Memory of Melanie Suzanne McBride Sweat". Dignity Memorial Obituaries. Retrieved September 15, 2016. ^ a b c d Ho, Rodney (October 8, 2014). "Atlanta actress Melissa McBride transforms Carol, her 'Walking Dead' character". Atlanta Journal Constitution. Retrieved March 23, 2015. ^ a b c "Melissa McBride". TV Guide. Retrieved March 23, 2015. ^ Lloyd, Sarah Anne (November 6, 2013). "Melissa McBride: 6 Things to Know About the Walking Dead Actress". Wetpaint.com. Retrieved March 23, 2015. ^ Hibbard, James (November 30, 2010). "AMC adds 'Walking Dead' cast". The Hollywood Reporter. Retrieved March 23, 2015. ^ Ausiello, Michael (April 10, 2012). "Ask Ausiello: Spoilers on HIMYM, Private Practice, Bones, Walking Dead, Parks and Rec and More!". TVLine. Retrieved August 8, 2015. ^ Ausiello, Michael (March 10, 2013). "Melissa McBride Clears Up Walking Dead Contract Mystery, Declares: 'I Am a Series Regular'". TVLine. Retrieved March 23, 2015. ^ Sprague, Rachel (January 18, 2013). "'The Walking Dead': Carol was supposed to die". Hypable.com. Retrieved March 23, 2015. ^ Goldberg, Lesley (October 16, 2014). "'Walking Dead': Is Carol Becoming the New Andrea?". The Hollywood Reporter. Retrieved March 23, 2015. ^ Schwartz, Terri (March 17, 2014). "Melissa McBride deserves an Emmy for 'The Walking Dead' Season 4". Zap2it.com. Tribune Media Services. Archived from the original on March 19, 2014. Retrieved March 23, 2015. ^ "TVLine's Performer of the Week: Melissa McBride". TVLine. March 22, 2014. Retrieved March 23, 2015. ^ Goldberg, Lesley (March 16, 2014). "'Walking Dead' Dissection: Melissa McBride Talks Carol's Devastating Decision". The Hollywood Reporter. Retrieved March 23, 2015. ^ St. John, Allen (March 16, 2014). "'Look At The Flowers': Carol's Wrenching Choice Changes 'The Walking Dead' Forever In A Shocking Episode 414". Forbes. Retrieved March 23, 2015. ^ Schwartz, Terri (July 3, 2014). "Emmys 2014: Melissa McBride deserves 'The Walking Dead's' first acting nomination". Zap2it.com. Tribune Media Services. Retrieved March 23, 2015. ^ Woodard, Darryl (March 20, 2014). "The Walking Dead: Melissa McBride, an Emmy Worthy Actress". The Huffington Post. Retrieved March 23, 2015. ^ Moye, Clarence (June 12, 2014). "FYC Best Supporting Actress – Drama: Melissa McBride". AwardsDaily.com. Retrieved March 23, 2015. ^ Carbone, Gina (May 22, 2014). "Give Melissa McBride an Emmy! The Walking Dead Fans Launch "McEmmy Campaign"". Wetpaint.com. Retrieved March 23, 2015. ^ Ausiello, Michael (July 10, 2014). "Primetime Emmy Nominations 2014: My Snappy Judgements". TVLine. Retrieved March 23, 2015. ^ Johns, Nikara (February 25, 2014). "'Gravity,' 'Desolation of Smaug' lead Saturn Award nominations". Variety. Retrieved March 23, 2015. ^ "40th Annual Saturn Awards Nominations Include The Conjuring, The Walking Dead". DailyDead.com. February 27, 2014. Retrieved March 23, 2015. ^ Bacle, Ariana (May 28, 2014). "Critics' Choice TV Awards 2014: And the nominees are..." Entertainment Weekly. Retrieved March 23, 2015. ^ Hanely, Ken W. (March 2, 2015). "For Your Consideration: The 2015 Chainsaw Award Nominees for Best Supporting Actress in a TV Series!". Fangoria. Retrieved May 28, 2014. ^ a b Tapley, Kristopher (March 3, 2015). "'Captain America,' 'The Walking Dead' lead 2015 Saturn Awards nominations". Hitfix. Retrieved March 23, 2015. ^ Kilday, Gregg (December 3, 2012). "Satellite Awards Nominates 10 Films for Best Motion Picture". The Hollywood Reporter. Retrieved March 23, 2015. ^ "INTERVIEWS WITH THE STARS ON THE HALLOWEEN HORROR NIGHTS EYEGORE AWARDS RED CARPET!". brite&bubbly.com. July 7, 2014. Retrieved March 23, 2015. ^ "MELISSA WAS NOMINATED FOR A SHORTY AWARD!". The Shorty Awards. Archived from the original on September 26, 2015. Retrieved July 20, 2015. ^ "Melissa McBride wins the "Online Love" Award!". Retrieved 11 August 2015. ^ "2014 winners and nominees". criticschoice.com. Retrieved 28 December 2016. ^ Cohen, David S. (27 June 2014). "Saturn Awards: A Genre Reunion and More Gold for 'Gravity'". Variety. Retrieved 28 December 2016. ^ Montgomery, Daniel (July 7, 2014). "'Orange is the New Black,' 'Game of Thrones' dominate Gold Derby TV Award nominations!". GoldDerby.com. Retrieved March 23, 2015. ^ Montgomery, Daniel (August 20, 2014). "'Orange is the New Black,' 'Breaking Bad' sweep Gold Derby TV Awards". GoldDerby.com. Retrieved March 23, 2015. ^ "Walking Dead's Melissa McBride Nominated For 2014 EWwy Award". Undead Walking. 13 August 2014. Retrieved 28 December 2016. ^ "Best TV Hero - Best of 2014: Television - IGN". IGN. Retrieved 10 January 2017. ^ "The 2015 FANGORIA Chainsaw Awards Winners and Full Results!". Fangoria Chainsaw Awards. Retrieved July 25, 2015. ^ "ComicBook TVAwards". Twitter. Retrieved 11 August 2015. ^ "The 2015 Tell-Tale TV Awards: Results! Outlander, Jane the Virgin, The 100, and More". Tell Tale Awards. Retrieved July 25, 2015. ^ "EWwy Awards 2015: Vote for Outlander, Jane the Virgin, and more Emmy-snubbed favorites". Entertainment Weekly. Retrieved July 20, 2015. ^ "Best Supporting Actress, Drama - EWwy Awards 2015 - Meet Your Winners - EW.com". Entertainment Weekly's EW.com. Retrieved 11 August 2015. ^ "CarterMatt Awards 2015 results: Melissa McBride of 'The Walking Dead' wins Top Actress". CarterMatt Awards. Retrieved December 30, 2015. ^ "Saturn Awards 2016 Nominees Announced". ComicBook.com. Retrieved February 24, 2016. ^ "Poppy Awards 2016: Vote for your favorite drama nominees". ew.com. August 22, 2016. Retrieved August 22, 2016. ^ "Poppy Awards 2016: Meet Your Winners". www.ew.com. Retrieved 15 September 2016. ^ "The Academy of Science Fiction Fantasy and Horror Films". www.saturnawards.org. Retrieved 2 March 2017. ^ McNary, Dave (15 March 2018). "'Black Panther,' 'Walking Dead' Rule Saturn Awards Nominations". Retrieved 18 March 2018. Wikimedia Commons has media related to Melissa McBride. This page was last edited on 30 March 2019, at 18:36 (UTC).